D. Ajacis majus (large Larkspur).-The stem of this is single, and varies in height, from 3 to 4 feet 6 inches; the flowers double, in a long, single, and compact spike, generally rounded off at the extremity. This kind has given the following varieties-white, flesh-colored, rose, mauve, or pucecolored, pale violet, violet, ashcolored, claret, and brown. D. Ajacis minus (dwarf Larkspur).-The stem of this is from 20 to 24 inches in height, and is even shorter when the plant is sown thickly or in dry or poor soils. The flowers are very double, and in a single well-furnished spike, usually cylindrical, and rounded off at the extremity, but rarely tapering. The principal varieties are-white, mother-of-pearl, flesh color, rose, mauve, pale mauve, peach blossom, light violet, violet, blue-violet, pale blue, ash-grey, brown, light brown, white striped with rose, white striped with grey, rose and white, and flaxcolored and white. D. Ajacis hyacinthiflorum (dwarf Hyacinth-flowered Larkspur).-The varieties of this group have been raised in Belgium and Germany. They do not differ from other kinds in form of flower, but only in the spike on which the flowers are set, being more tapering, and the flowers farther apart than those of the two previously mentioned groups. 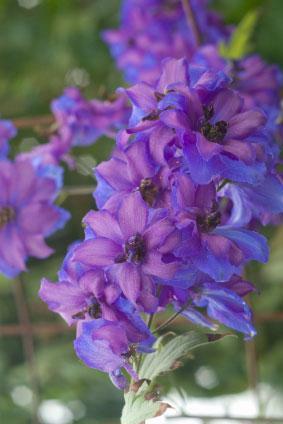 There is a strain called the tall Hyacinth Larkspur. Other strains mentioned in catalogues are the Ranunculus-flowered (ranunculiflorum) and the Stock-flowered, both of which are worth cultivating. Annual Larkspurs should be sown where they are to remain at any time after February when the weather permits-usually in March and April. They may also be sown in September and October, and even later when the ground is not frozen, but the produce of winter sowing is liable to be devoured by slugs and grubs. The sowing may be made either broadcast or in rows 4 inches to 8 inches apart, and the plants should stand 4 inches or 5 inches asunder. The branching varieties may be sown in reserve beds, and in March when about 12 inches or 16 inches high should be transferred to the flower-beds, lifted carefully with balls of earth round the roots, so that they may not suffer. These branching varieties are well suited for the garden, either in masses of one color or of various colors. They may be planted in borders or among shrubs thinly planted. Azure Fairy and Blue Butterfly are very beautiful sorts. Larkspurs are at their best in June and July. Sown in March, a succession is obtained into September. branched Larkspur (The Annual Larkspurs Consolida) - This species has branching stems and beautiful violet-blue flowers hung on slender stalks, and coming later than those of D. Ajacis. It embraces several varieties, both single and double, all of which may be reproduced from seed. The principal sorts are white, flesh color, red, lilac, violet, flaxen, and variegated. The varieties especially worthy of cultivation are candelabrum, bearing pyramidal spikes of flowers of various colors; and the Emperor varieties, of symmetrical bushy habit, which form compact and well-proportioned specimens, 1 1/2 feet high by 3 1/2 feet in circumference, doubleness of flowers possessing great constancy. There are three colors-viz., dark blue, tri-colored, and red-striped. In D. tricolor elegans the flowers are rose-colored, streaked with blue or purple, and about 3 feet high.